Dubai, UAE, December 22, 2018: Dubai-based firm Viva City has announced that the construction work of Sport Society, the world's largest sports mall, in Mirdif Dubai is well on track for completion in Q1 of 2020. “The project’s construction work is progressing according to schedule and within the allocated budget, thanks to the efficient operations of Khansaheb Civil Engineering, the company commissioned to carry out the construction works. The world-class building is well underway and on programme due to the depth of Khansaheb’s experience, innovation and expertise in building such key retail projects,” said Viva City's Head of Design, Edgar Bove. “The process of building the world's largest sports mall faces many challenges, especially as the project is designed to be an architectural icon that will deliver a unique experience combining shopping, entertainment and sports activities,” Bove added. “The award of the Sport Society contract underlines the reputation that Khansaheb holds for delivery on time of complex major projects that demand a high quality finished product and Khansaheb’s experience and track record in the delivery of key retail projects that have challenging completion schedules,” said Steve Flint, Group General Manager of Khansaheb Civil Engineering. The pouring of almost 60,000 m3 of structural concrete. 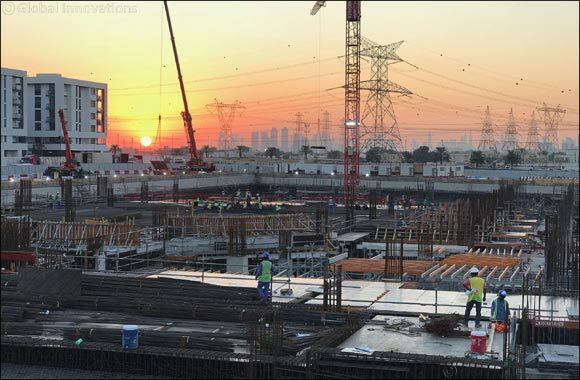 Reinforcement with over 9000 tons of steel over 6 floors (including both basements and roof) which will be formed using over 160,000 m2 of formwork. The erection of nine structural steel trusses, each weighing around 70 tons (each truss will be erected to a maximum height of approximately 30m above the ground in one lift using a crawler crane). Theatrical lighting to create dramatic ambience during events. Full NHL regulation size ice rink cooled to -5 degrees centigrade at floor level during the scorching Dubai summers. Pre-fabricated, factory assembled reinforcing steel modules of up to 2 tons per module, which can be laid by around 4 workers in 15 minutes, a record time compared to traditional constructions of this type. Pre-fabricated, factory assembled & multi-disciplinary MEP modules. Pre-fabricated, factory assembled and Pre-finished truss sections of 14 tons per module, five sections per truss bolted together at ground level before being finally erected as one composite unit at around 70 tons.